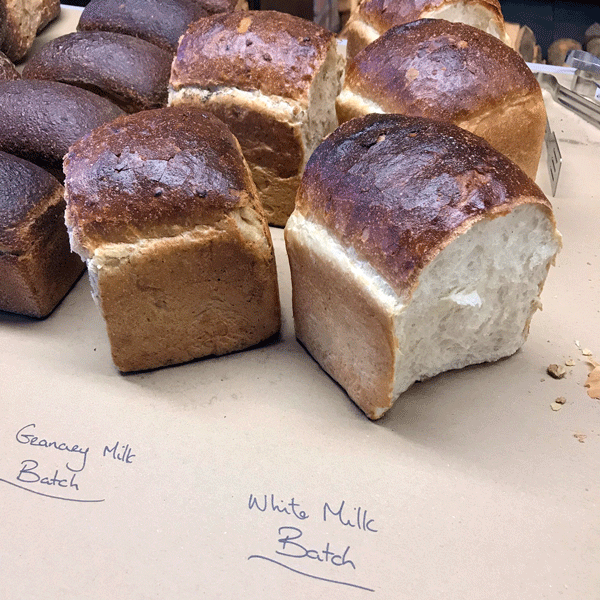 Here’s a prediction for you: we’re prepared to wager that there are folk who will become devotees of Eoin Cluskey’s Bread 41, and who will never, ever, buy a loaf of sourdough, the very bread that is the speciality of this Dublin city bakery. Instead, they will join the queue – there is always a queue, always – and then they will happily ask for: a batch loaf. Except Bread 41’s batch loaf is actually as fine as their sourdough selection. It has texture and taste. It makes a killer toastie, an excellent sandwich, and great toast. It has flavour, and behaves like real, proper, decent bread. No blandness. No cotton wool. Just good tasting, good textured white bread. The fact that 41 would work out how to make a good batch loaf tells you a lot about this dynamic Dublin enterprise. For one, it shows that they aren’t up themselves: want batch loaf? We got it. Secondly, it shows the attention to detail that characterises 41. As we sat enjoying a coffee and a bun – their wowee! 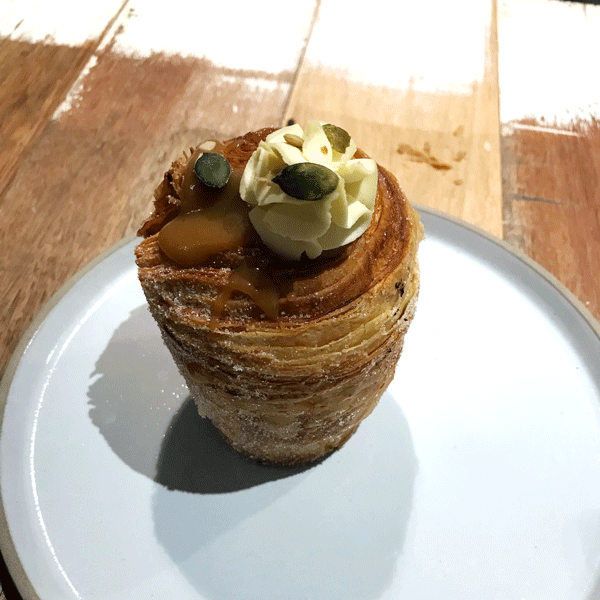 pumpkin cruffin – we watched as the barista weighed the ground coffee in every single cup he was brewing on a tiny weighing scale, lifting a tiny amount of ground coffee from each cup, before he fastened it into the machine. He did it, he said, to ensure he had absolutely the correct ratio for every cup. That’s dedication, and it’s ultimately there in the cup: the 3fe coffee they brew up is pretty perfect. We first visited 41 on the morning they opened in early September. 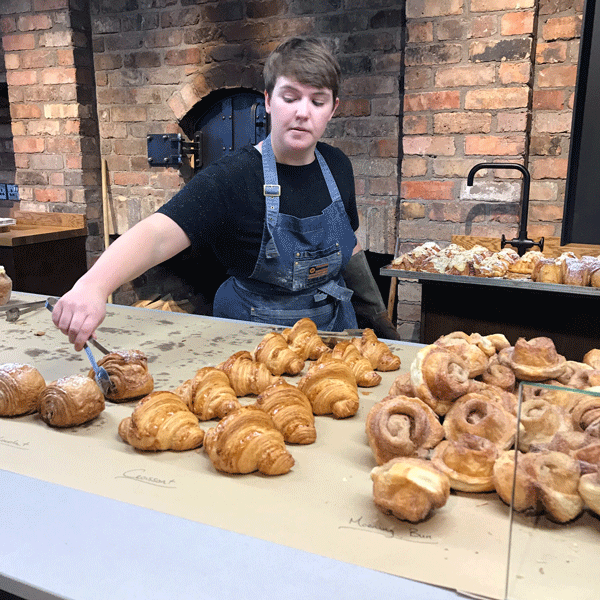 Visiting again in early November, things were running smooth and steady, the flow of breads and buns steadily replenished at the counter, the breakfast plates ferried to hungry customers, the staff really getting into their groove. Bread 41 is rockin’ it.